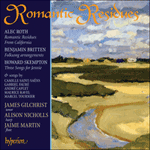 The original version of Alec Roth’s From California was first performed on 2 February 1991 at the West Road Concert Hall, Cambridge, by Geoffrey Dolton (baritone) with the London Sinfonietta conducted by the composer. The song is part of a cycle (as yet unfinished) called California Songbook—settings of poems written by Vikram Seth when he was living on the West Coast of the USA. This new version, for tenor, flute and harp was made especially for this recording and is dedicated to Alison, James and Jaime.